Amanda and Frank had their wedding at the Foundry Suites in Buffalo. Amanda had a huge suite to get ready in. After doing detail images and having the bridesmaids get into their dresses, it was time for the bride to get into her wedding dress! We cleared out a bunch of furniture in this room. It had the best lighting and the most room for the bride. There was also a massive carpet we rolled up too! We wanted the hardwood floors to show! After she was dressed, it was time for bridal portraits. I loved this little set up. I really wanted a bright and airy look for this. That is my style and I was lead photographer. Neal was photographing another wedding. I wasn't too thrilled with the green couch at first. But when, Amanda sat down, the color of her dress looked really good with it. To balance that out, we put her bouquet in as well. It covered a little more green! We made sure the curtains were open as much as they could be and let a ton of light in. I really liked the end table with the lamp on it too! We decided to keep it in for the shot. Amanda had a gorgeous wedding gown. We spread out the dress on the couch and had her rest her arm on the edge. She had the best posture too! Then I had her look down. Everything about this image worked so well. Even her hair was perfect for this style! 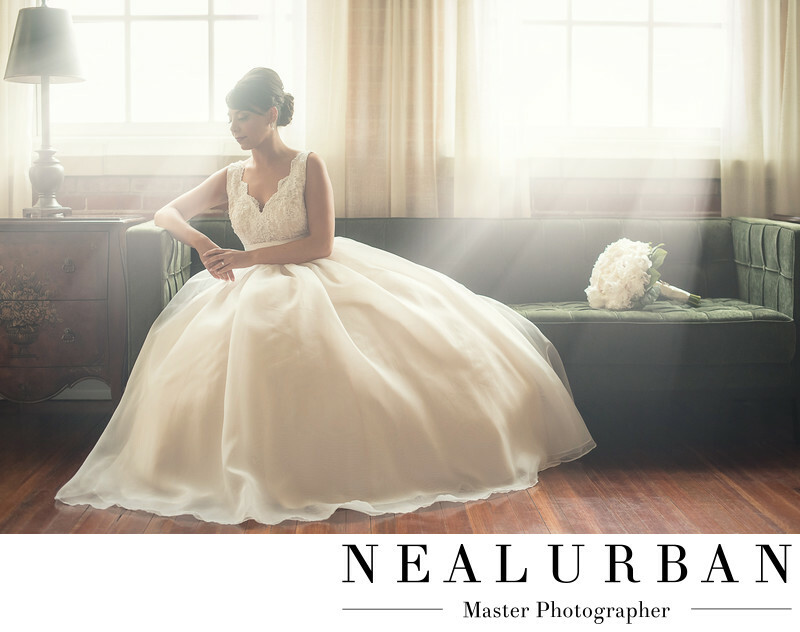 After the wedding, Neal saw this image and took it to the next level. He made the image look a little more antique and brought out some more detail! I loved it!